First Love Missions: Happy Rosh Hashanah! 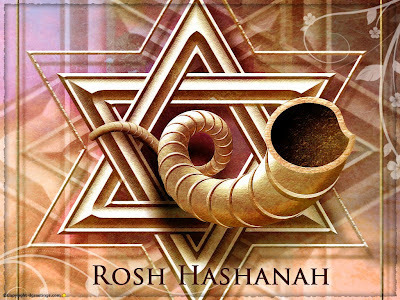 The Jewish New Year, aka Rosh Hashanah, Yom Teru'ah or Festival of the Trumpet, and the Ten Days of Awe begin this Sunday at sundown (or 6PM) with the blowing of the shofar and celebrating with food such as apple dipped in honey. We are entering the appointed time on the Hebrew calendar leading up to the holiest day of the year, Yom Kippur, or the Day of Atonement, so this is a time of celebration and preparation! The Talmud states that three books of account are opened on Rosh Hashanah, wherein the fate of the wicked, the righteous, and those of an intermediate class are recorded. The names of the righteous are immediately inscribed in the book of life, and they are sealed "to live." The intermediate class are allowed a respite of ten days, until Yom Kippur, to reflect, repent and become righteous; the wicked are "blotted out of the book of the living forever. In Jewish liturgy Rosh Hashanah is described as "the day of judgment" (Yom ha-Din) and "the day of remembrance" (Yom ha-Zikkaron). Some midrashic descriptions depict God as sitting upon a throne, while books containing the deeds of all humanity are opened for review, and each person passing in front of Him for evaluation of his or her deeds. In this time of honoring our Judeo foundations that have guided this blessed nation, we repent of any spirit of arrogance, pride, and rebellion. Pray for revival and repentance so that times of refreshing may come from the Lord. Let us enter in again to the finished atoning work of Jesus Christ at Calvary. In solidarity with our Jewish friends around the world, we pray for God’s blessing and peace during this time of awakening from slumber and turning back to serve the Living God. We speak blessing and protection for Israel and the Israeli Defense Forces. John 1:29 “Behold! The Lamb of God who takes away the sin of the world! Micah 17:18-20 "Who is a God like You, pardoning iniquity and passing over the transgression of the remnant of His heritage? He does not retain His anger forever, because He delights in mercy. He will again have compassion on us, and will subdue our iniquities. You will cast all our sins into the depths of the sea. You will give truth to Jacob and mercy to Abraham, as You have sworn to our fathers from days of old."